If you want your estate agency to stand out in a crowded marketplace, you need eye-catching and memorable displays. While the internet has changed the way many people hunt for property, the value of presenting a professional image on the high street cannot be underestimated. An attractive window display will catch the eye of passersby whilst inspiring confidence in existing or potential clients. Window displays are a vital part of any successful estate agency. Displaying your most popular or prestigious properties in the window ensures maximum interest from anyone passing and can help draw in potential buyers and renters. They will also ensure potential sellers or landlords have a good impression of your business and will be more likely to consider you to market their own properties, even if they are not currently looking for an agency. Cable display systems are a particularly popular method of displaying property details or promotional material in windows as they can be customised to fit any space. They also look streamlined and professional. They are ideal for displaying posters or sheets that are to be regularly changed as it is extremely quick and easy to swap one sheet for another. It’s also important to think about your business’s location to ensure you use the best display for your particular audience. If you are located on a busy pedestrianised high street, you will likely attract the attention of a lot of people who might not be particularly thinking of using your services but who can be tempted to stop and look at your window display. If you create a memorable and welcoming exterior, people will be more likely to remember your business when they do need an estate agent. If your business is located on a main road with lots of vehicular traffic but not many pedestrians, think of ways to make your estate agent displays stand out to passing motorists or bus passengers. It is unlikely they will be able to see individual property details, but by making information posters featuring any special offers or promotions eye-catching and large enough to see from the road, you’ll be widening your potential client base. It should go without saying that both the interior and exterior of any windows should be regularly and thoroughly cleaned to ensure any displayed images and property details can be easily viewed from the street and to maintain a professional image. Once you’ve got clients inside your premises – whether they are vendors, potential buyers, landlords or renters – it’s important to create a pleasant, welcoming environment for them. Professional displays and attention to detail will reinforce the impression that clients can feel confident in your business. The nature of the displays best suited to your business will depend on the available space and your office’s layout. If you have plenty of wall space, you might want to use the same cable display system that is featured in your window. This makes it easy to display lots of properties in one space. Another option is a rod system. These are available in a variety of sizes, allowing you to perfectly match your wall space. Displays are mounted on rods, giving a clean, modern look. Standalone wall displays are a good choice if you have limited wall space or want to try a more creative layout. Wall displays are a great way to utilise otherwise wasted space, and you can experiment with different arrangements to find the most effective layout. Consider grouping several properties together in individual wall-mounted displays or highlight prestigious properties by mounting them on their own. Freestanding displays are perfect for making use of desk and shelf space, and they are great for highlighting important information, such as promotions or changes to regulations or business practice. 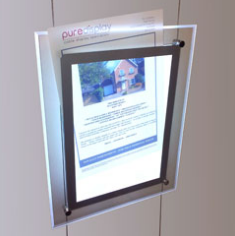 You might also choose to use a freestanding display to present leaflets or brochures to clients. This works well outside and inside if you have a suitable space. Whatever displays you choose, the most important thing is to check that they can easily be updated. Before making your decision, ensure any display units allow for easy access and that you can quickly replace posters or leaflets without hassles.